The 1989 version of Pet Sematary is one of the more divisive Stephen King adaptations. At its best, the film was a genuinely creepy descent into the grieving process that lived up to its haunting premise. At its worst, the film could also be slow in places and come off as overly melodramatic. The 2019 update maintains the creep factor of its predecessor, but the melodrama has been replaced with a sense of humor. The pacing issues have been sorted out as well, without a dull moment in sight. 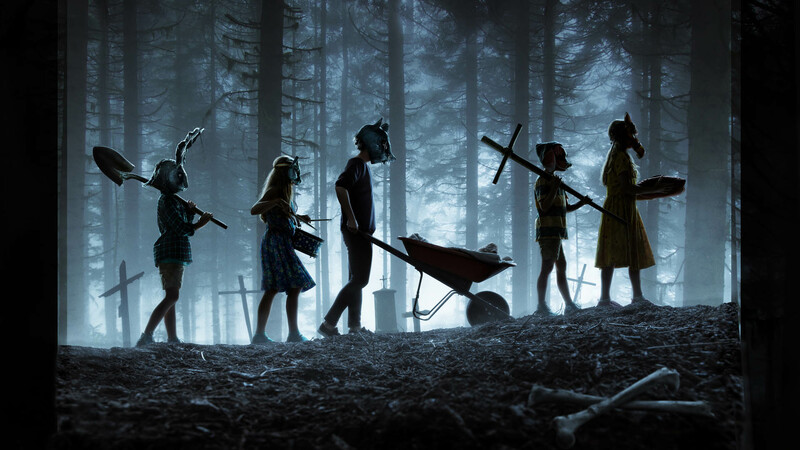 While it doesn’t break new ground for the horror genre like Jordan Peele’s Us, Pet Sematary is a grisly fun time that should appease anyone who enjoyed the remake of It. The film of course centers on the Creed family with patriarch Louis (Jason Clarke), matriarch Rachel (Amy Seimetz), eldest daughter Ellie (Jeté Laurence), youngest son Gage (Hugo/Lucas Lavoie), and cat Church. Since this is a Stephen King story, the family naturally moves to a rural part of Maine. Wandering through the woods, Ellie discovers a pet cemetery, although the sign has been misspelled “Sematary.” After the family’s feline gets hit by a truck, Louis and Rachel aren’t sure how to break the news to Ellie. Rachel has an especially difficult time discussing death after what happened to her sister Zelda, which is revealed through flashbacks that can only be described as spine-chilling. As Louis prepares to bury the cat, he finds that death has a loophole. The standout performance from the original Pet Sematary was Fred Gwynne as kindly neighbor Jud. Gwynne created a persona so recognizable that it’s been parodied multiple times on South Park. If there’s one actor’s who’s perfectly suited to fill Gwynne’s shoes, however, it’s John Lithgow. And yes, the filmmakers acknowledge the irony that Lithgow is acting opposite a cat named after Winston Churchill. Not wanting to see Ellie suffer the loss of her cat, Jud advises Louis to bury Church in a special area. The next morning, Church returns to the house alive and well, but he now has more in common with Cujo than his old self. Although Louis begins to see the error of his ways, he can’t resist returning to the burial ground when death strikes the family again. Without delving into spoiler territory, Jeff Buhler’s screenplay takes a few liberties with King’s original novel. While the first half is a mostly faithful adaptation, the second act starts to veer off into uncharted territory. It all accumulates to a wicked climax that fans of the book and first film aren’t inclined to see coming. These changes are for the better, however, as they don’t just give this version an identity all its own, but also lead to some great character moments. Most importantly, the story’s central theme of grief and the acceptance of death aren’t lost in the process. As entertaining as Pet Sematary is, there are a few areas that could’ve used some fine-tuning. Throughout the film, we see various characters wearing mysterious animal masks, as if they wandered off the set of The Wicker Man. Although it’s a bloodcurdling image, there isn’t much of a payoff with them. The ending is also somewhat abrupt and leaves the audience wanting to see what happens next. Of course, any movie that leaves you asking for more clearly did something right and there is indeed a lot to enjoy in Pet Sematary. The acting is universally strong with Seimetz turning in an emotionally tormented performance and young Laurence exemplifying a wide range of talents. Directors Kevin Kölsch and Dennis Widmyer have made an atmospheric thriller draped in foreboding tension. Remakes don’t always work, but this was one old story worth unearthing. This entry was posted in Reviews and tagged Horror, Thriller on April 5, 2019 by Nick Spake.